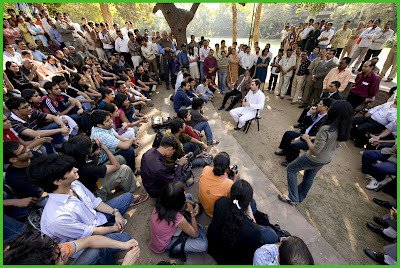 Image 01: Rahul Gandhi with NID students, faculty and staff at the Amphi-theatre behind the NID Charles Eames Plaza. It is many years since we have had a national politician showing any interest in design and here we had a young and enthusiastic cutlet of a politician dropping in for lunch at the student canteen with the z-level security team running around in circles while he tried to integrate with the young design students and have a cozy conversation. The NID Director, Akhil Succenna and the Chairman Education, Pradyumna Vyas and their large entourage of followers had to literally run to keep up with the swift movements of the young national leader and Member of Parliament from the Youth Congress while he whisked his way through the NID lawns and to the back campus for lunch date with students in an impromptu visit that was as informal as it was stimulating. Rahul Gandhi came visiting an almost forgotten place three generations after his great grandfather Pandit Jawaharlal Nehru the then Prime Minister of India had approved the formation of the National Institute of Design at Ahmedabad and this is also exactly Fifty Years after the writing of the insightful Eames India Report of 1958. This gives me an opportunity to reflect on the state of design in India and its status in the country vis a vis Science, Technology and Management, all of which receive substantial support from the Government for a variety of activities and this has been the case over the past five decades while design has remained on the back-burner of Government Policy all through this era of development and change. We now face climate change and financial meltdown of the global economy and perhaps it is time to look at design for some answers if only a reasonable investment can be made in this activity and some policy intiiatives can also be initiated to nurture the disciplines of design that are needed by as many as 230 sectors of our economy that is still breezing along in blissful ignorance of this crying need. After his four hour long tour of NID canteen, studios, workshops and lawns and finally in the shade of the large Neem tree over the NID amphi-theatre we got to meet him face to face in a very informal and human setting. I was particularly surprised and pleasantly so when he walked up to me and shook my hand asking what I did at NID!! Everything – teaching, research and living… I said. Image 02: Rahul Gandhi in a group picture with NID community at the NID amphi-theatre. In the discussions that followed he asked students what they felt about the state of politics in India and what they felt about the politicians in India. 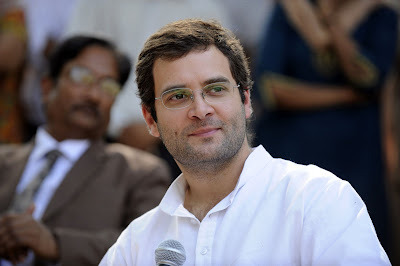 They responded with candid statements and some naïve ones that gave Rahul Gandhi an opportunity to show his maturity as a national politician and share his own journey into politics after the death of his father, Rajiv Gandhi who was also a former Prime Minister of India. His grand mother, Indira Gandhi, another great Indian Prime Minister, had visited NID in 1964 when Charles and Ray Eames were working at NID on the classic Nehru Exhibition that went on to tour the world across many countries. This exhibition gave me the opportunity to learn design in the Eames tradition when I worked on it for the 1972 version that was set up at New Delhi and then travel to Chile in January 1973 to help set it up in the museum at Santiago, a life changing experience for me, personally. This is where I met President Salvadore Allende briefly on the 26th of January 1973 when he came to open the exhibit in the presence of the Indian Ambasador and his delegation in Chile. A few years later we got the book “Platform for Change” by Stafford Beer and this informed us of the strategic role that design had played in the shaping of the Chile’s economy in the Allande era which caused his assassination because it threatened the big brother nearby and the rest is history. Design is a political tool and it is also a political activity if one looks at the definition by both Tomas Maldonado in his book “Design, Nature, Revolution” and the other by Harold Nelson and Eric Stolterman titled “The Design Way: Intentional Change in an Unpredictable World”. Both these books strip the myths about design as a mere associate of art used to bring aesthetic value to industrial produce and places the true role of design as a transformational process that can indeed bring intentional change of great value across society and in India this is what is needed in the 230 sectors of our economy today. 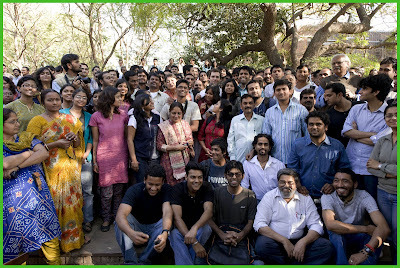 Image 03: Rahul Gandhi and NID Director, Akhil Succenna at the amphi-theatre meeting with NID students and faculty today. I asked Rahul Gandhi what he would do for design when he went back to Delhi and back to the Parliament. He asked back, what do you want me to do? NID students and faculty and its wide spread alumni need to ponder this question and act quickly and empower the NID Director to write a coherent letter to the potential champion of design in New Delhi on the possible agenda for design in India in the days ahead. We do hope that the next 50 years is an entry into the era of Design for India and Design with India….. We can dream and act quickly. What do you think can be done? Do we need a Ministry of Design? India needs design across all its Ministries – Rural Development, Education, Communication, Industry – and many more. Will this happen soon? How do we make it happen? Can the National Design Policy be rolled out of its cocoon and made active in the field sooner than later? I look forward to some answers and some real action, soon. I am however happy that NID gifted him a copy of our new book "Handmade in India" and I do hope that he takes this forward as a starting point for design action across India. Image 04: Five posters on “visualizing sustainability” that were discussed at Davos at a special session on Sustainability on 29 January 2009. Perhaps this is what the World Economic Forum (WEF) had in mind when it asked NID and its faculty and student teams to explore the issues that faced the world on the subject of Sustainability and asked them to offer some insights into how these intractable problems – nay wicked problems – could be addressed by the business community in the days ahead. As an outcome of this invitation from the WEF, NID and its teams prepared five posters that attempted to visualize the approaches towards a more sustainable world and these have been discussed at Davos and we await news from the Forum of the outcome of the deliberations there. We hope that the impact is not just immediate but also long term, the world is in dire need of such a long term impact. I hope that we have succeeded in our mission here, only time will tell. 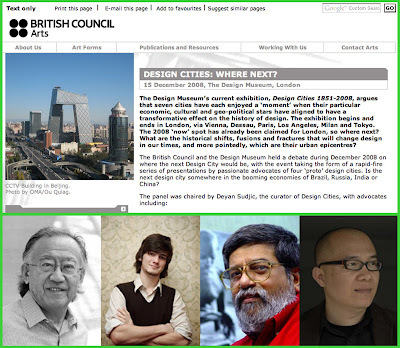 Image: The British Council Arts and Architecture page with the participants from the BRIC nations at the Design Cities Debate: Ruy Ohtake: Brazil, Denis Cherdantsev: Russia, Professor M P Ranjan: India and Ou Ning: China. Audio version of the Design Cities Debate. Or download the 44MB mp3 file directly from here. Other links to the event are here below from the earlier posts on Design for India. Image: Screen shot of the Design Week website reporting the success of the “Design City” Debate in London. Adam Welch reporting from London has carried a report in the Design Week of 8 January 2009 about the Debate at the Design Museum in London that was held on the 15th December 2008. Adam Welch was amongst the audience that polled at the end of the four nation debate that involved Sao Paolo, Moscow, Beijing and Bangalore. Read more about the event and the outcome of the debate on the Design Week website here. Image 1: Fence Bench designed by Andreas Bergmann which arrived as part of the “Somewhat Different” exhibit after unloading from trucks at the Design Gallery at NID. 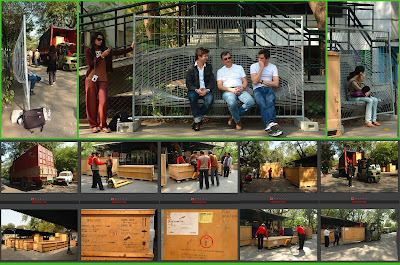 Volker Albus, designer and curator of the exhibition is seated in the middle with his colleagues with Dimple Soni, NID Faculty standing besides while the task of unloading and setting up is in progress. “Somewhat Different”, an exhibition organized by IFA – Institute for Foreign Cultural Relations in Germany opens later this week in NID. 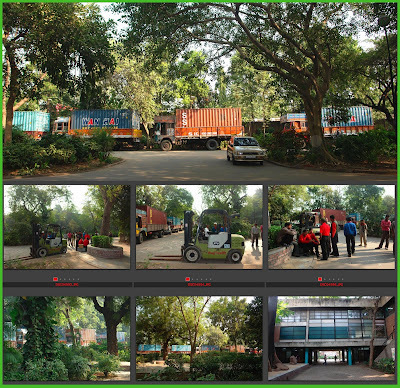 The trucks arrived over the weekend and everyone was curious to see a long row of six trucks each with a huge container as its load standing at NID for a couple of days. Yesterday the Germans arrived and the containers wee opened and out came the boxes in very systematic German design and each box was carefully labeled and carefully unpacked and put away in the car park to be used again when the exhibit had to be repacked for further shipment. “Somewhat Different” is the theme of the exhibition and in all the curator, Volker Albus, has selected forty-seven individual designers and design studios from Germany and along with this he has included the work of twenty other designers based in several European cities. These designs have been selected for their being a slight twist away from the conventional and not for their being unnaturally different! A subtle twist brings all the difference, and this he claims is a new trend for good design from Europe today. The exhibit opens in a few days from now and I will make a more detailed post when the exhibit is formally announced and made open to the public. Those interested in knowing more can contact the Corporate Communications at NID by email at pro@nid.edu. The systematic manner in which the unpacking and handling of the cases was a lesson in logistics for those students and faculty who wished to stay informed. Some were curious and came out with their cameras while others failed to turn up on the BMW side of the campus and may have missed the event altogether. There is always something interesting happening on campus and we have learned to stay curious and learn as we go along. The open electives in now on across the campus and several visiting faculty are also involved in conducting these workshops. I will come back with more about this particular exhibit and the “Swords into Ploughshares - Fences to Sit” by Andreas Bergmann is just one of the numerous designed objects that have arrived to stir up a debate about trends, relevance and sustainability, I hope. With Satyam having shown us yesterday how wrongly a sacred word can be used and abused as a slogan for a company that has now become an antithesis for the concept itself, perhaps cultural and commercial expressions in materials too have an element of honesty that needs to be appreciated and recognized. 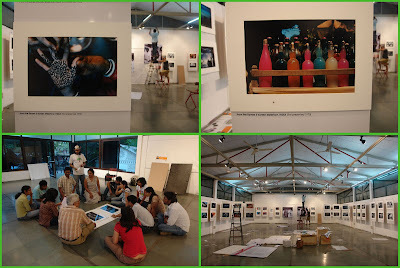 More, as we examine the exhibit in it’s setting at NID next week. The “Somewhat Different” exhibition will be open at NID from 16 January 2009 to the 7 February 2009 after which it will travel to the Lalit Kala Akademy, New Delhi and be on display from 10 May 2009 to 30 May 2009. Both these exhibits are being coordinated by the Goethe-Institute in Mumbai and New Delhi respectively. Image 1: Eames Demitrios at the opening of the Eames Photo Exhibit at NID, the book of 100 Eames Quotes and his personal inscription on my copy. The 100 quotes are presented in the following languages: English, Complex Chinese, Simplified Chinese, Japanese, Hindi, Brazilian, Portuguese, and Spanish. Eames Demertios visited NID to launch the Eames 100 Photo Exhibition, which he had contributed to select on behalf of the Herman Miller Inc. and the exhibit has traveled across many nations before coming to NID to coincide with the celebration of Eames India Report (download PDF 360 kb) reaching the 50-year landmark. This gives us an opportunity to reflect on the impact of the Eames legacy in India and the impact of the National Institute of Design on the design needs of India, which is still very large and complex. However the larger series of events that I had proposed for the Eames Report Silver Jubilee celebration was unfortunately truncated due to lack of official fervor to back the event, which were however announced over one year ago. However, for this particular event I was away at a lecture meeting in Pune organized by the Interior Designers Association of India which was also planned to coincide with the Eames India Report celebrations and this meant that I missed being at the NID event since the dates clashed. I was however able to see the student and faculty excitement before the event and later hear about the opening ceremony when I came back to NID a couple of days later. I missed meeting Eames Demetrios this time but I was able to visit the photo exhibit several times and ponder on the Eames vision of India as shown through the pictures that only he could compose and capture with his inimitable sense of vision and purpose. 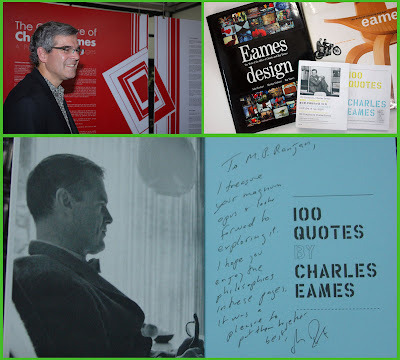 Eames Demetrios was kind enough to leave an inscribed copy of the Eames 100 Quotes book for me as shown above. Charles and Ray Eames had much to say about the world and about design and this book is a handy guide for students from across the world. 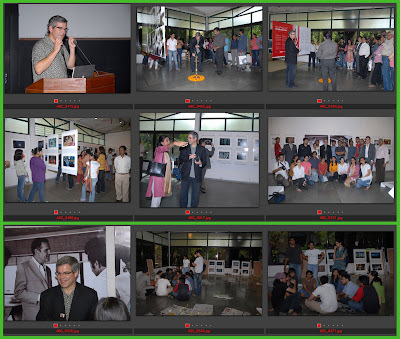 Image 2: Eames Demetrios at NID with students and faculty on the occasion of the Eames Photo exhibit opening ceremonies at NID Gallary, an event that I unfortunately missed. NID has been a Mecca for great world designers and in the 60’s and 70’s we had some of the most distinguished international designers, over a 100 of them, visiting NID in the aftermath of the 1958 Eames India Report, based on which the NID was set up in 1961 by the Government of India. Having his grandson visit NID in 2008, exactly 50 years after that writing of the report was indeed a significant line of continuity for the shaping of design for the Indian cause. The documentation of NID’s contribution is however very sketchy due to some deep seated apathy to documentation and publication from the official and faculty sources at NID which unfortunately continues to this day. The last comprehensive publication of the NID’s professional and education work was prepared by Gira Sarabhai (one of the founders of the NID and the Calico Museum in Ahmedabad) in 1970 titled “NID : Documentation 1964 to 69” which is now fortunately available as a PDF file for download from this link below. (NID Document PDF File 25 MB). Aditi and I started the Young Designers series of publications that documented the work of Diploma Projects of our students from 1989 and this has fortunately been maintained by the Institute as an unbroken tradition since then with one book being produced each year and last year onwards the student diploma work has been showcased on the website at these links below. Young Designers 2007 and Young Designers 2008. However this still leaves out several major areas of work done by students and faculty through education, research and outreach activities and the full range of professional work done be the faculty of the Institute. The tradition at NID has been that faculty have not been permitted to do any personal practice and all the work had to be done through the Institutes professional practice wing or outreach wing. The Institute does have some research publications such as my book on “Bamboo & Cane Crafts of Northeast India” (download PDF 36 MB) and more recently the “Handmade in India” which I have reported about on this blog at these links here. There have been a handful of other publications by faculty colleagues but these however do not cover the vast contributions made by the NID faculty and this represents a huge research opportunity for some young design historian to follow up on in the days ahead. Image 3: NID students and faculty from the Furniture design discipline in hands-on mode planning the setting up of the Eames Photo Exhibit at NID Gallery. Anuya Naik, Rama Krishna Rao and L C Ujawane in discussion with Furniture Design students on how to mount the Eames Photo Exhibit in the NID Gallary. 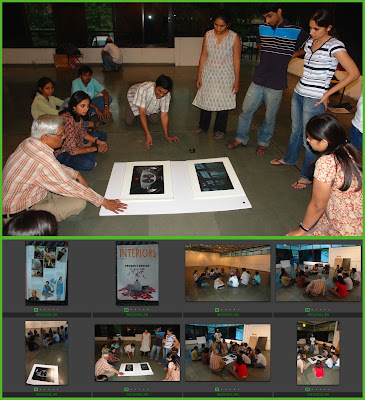 Image 4: NID students and faculty in active mode of setting up the Eames Photo Exhibit and being inspired by the Images of India from an early visit by Eames. The furniture design programme at NID was inspired by the work of Eames although the formal education programme started in 1969 with design teachers from Germany, the early beginnings of the Eames influence came from the full set of furniture and products that were donated from the Museum of Modern Art’s classic design collection which included many items of Eames furniture in wire, plywood, fibre glass and cast aluminium range besides original products by Alvar Aalto, Le Corbusier, Mies van der Rohe and others too numerous to be named here. These originals in our prototype collection were a source of inspiration and all students of furniture design got an opportunity to study these in detail as part of their education at NID. Further the NID’s wood and metal workshops were constantly producing a number of furniture designs by international masters like George Nakashima and our own present day master, Gajanan Upadhayay, and this production continued till recent times as a live reminder of high quality of workmanship as a living tradition inside the NID workshops. It is not surprising that the students and faculty from that era had a deep understanding of materials and process and a very refined range of furniture did get designed and made at NID till the end of the 90’s. The turn of the century was a bit of a disaster since after the bamboo boards & beyond workshop of 2000 the wood workshop was rudely dismantled to make way for the digital Design Vision Centre (DVC), which all but destroyed the hands-on tradition that had taken deep roots at NID. Somewhere we seemed to loose our way and slogans of “Mind to Market” took on the place of real “Hands-on” action that was the true NID way in the spirit of Eames. 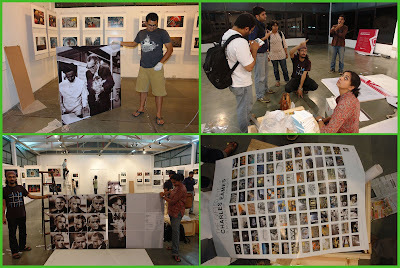 Image 5: Anuya Naik with NID students setting up the Eames Photo Exhibit and the 100 images poster that captures the whole exhibit at a glance. I am indeed happy to see the return of faculty and student involvement in hands-on activities of exhibition design and fabrication and I do hope that this will be continued to other such opportunities in the days ahead. The students who pass through these experiences develop a deep sense of collaborative spirit and are less prone to ego trips when deciding the form and quality of their design offerings. Design is indeed changing but we do not need to throw the baby out with the bathwater and we will need to deeply examine the role of the digital in our design processes and preserve those values that are durable from the hands-on tradition which may indeed turn out to be the very heart of design thinking and action in the days ahead. The furniture design activity at NID has retained the deep respect for prototype building and learning by doing is alive and well in this discipline while a body of theory has also been introduced into the programme along with a considerable amount of exposure to digital tools and processes in information processing, drawing, image management and presentation documentation etc. 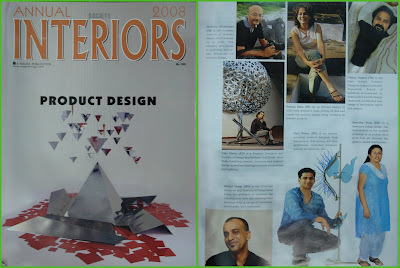 Image 6: An article in an Interiors magazine featuring great Indian product designers. It is gratifying to see that all six designers were NID graduates and all of them have been my students at different times. Sandeep Mukherjee, Reboni Saha, Vibhor Sogani, Neil Foley, Mukul Goyel, and Alex Davis: clockwise from top left. Last year, in late November, as the Eames Exhibit was being assembled at NID we came across this article in a national Interior Design magazine that celebrated the work of some of the finest product designers of India. It is not surprising that all the designers featured here were products of the NID workshops “hands-on” tradition and these were the same people who found value in pottering in our workshops with materials and concepts that has now been recognized as valuable contributions by that design media in India. There is value in the hands-on approach and we must cherish this as a way forward even in the digital era. There are many other design groups who have set up entrepreneurial ventures across India in the areas of textiles, furniture and ceramic design and these enterprises have grown over the years to be recognized as a design led industry from India. However the designers in India have failed to organize themselves into associations at a professional level and due to this their influence on National policy is still rather limited. The SIDI (Society of Industrial Designers of India) that flourished during the 70’s to 90’s became defunct due to apathy from members and the self-interest of the office bearers. Some recent initiatives in the form of the AIDI (Association of Industrial Designers of India) started by the Bangalore designers and the informal online efforts of the DesignIndia group are some fledgling initiatives in the making. The Pune Design Foundation is yet another recent initiative and we hope these shape up and take root to lead the design movement in India in the days ahead. 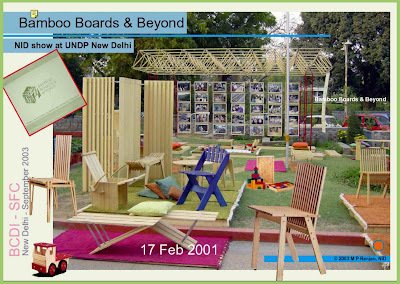 Image 07: Exhibition of Furniture made from Bamboo Boards at the UNDP Lawns on 17 February 2001, which made a huge impact in New Delhi, and on National Policy that led to the creation of the National Bamboo Mission, which is still in progress. I got my 5 minutes of fame since I was invited to the NDTV studio that night to be interviewed live on the 9 o’clock news just after Dr Anil Agarwal of Down to Earth fame had completed his interview on the subject of environment. Awareness about global warming was still a long way off in the minds of people at large. In the late 90’s and early years of this century we have had a growing interest in bamboo as a furniture design material and NID and its Centre for Bamboo Initiatives has been at the heart of this development. As many a 40 students from furniture and product design and over a dozen faculty colleagues were involved with me to explore this material and as a result we have a well documented body of work that is perhaps a significant contribution to world knowledge of building with bamboo and this is well acknowledged as a result of the publication of our, books, CD ROMs and web based publications that can be seen at these links here on this blog as well as on my website at this link below. (web link to Bamboo Initiatives) (links to other blog posts). Image 08: Sandeep Mukherjee and Sarita Fernandez set up Quetzel in Bangalore, which makes fine furniture in the Eames tradition of design and build. 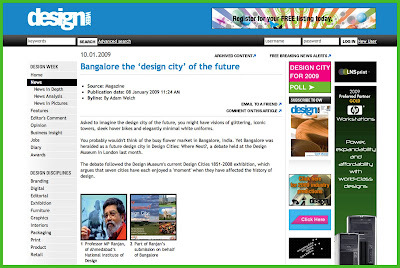 In my presentation last month at the Design Cities Debate at the Design Museum in London I shared several case studies from design groups in Bangalore. 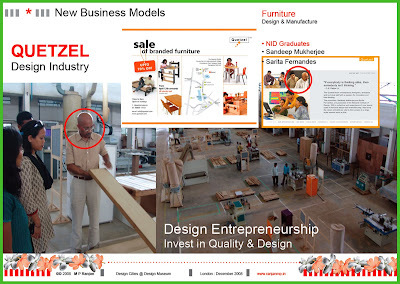 Quetzel and Dovetail are two such cases of innovative companies set up by NID graduates who set out to make furniture of their own design and these have now grown into substantial business groups in their own right. 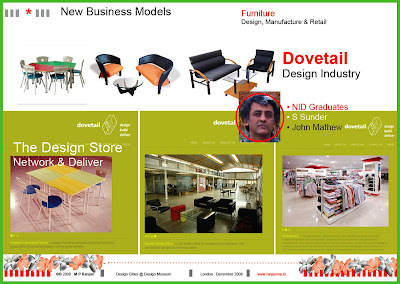 Image 09: S Sunder and John Mathews have set up Dovetail which also designs and produces fine furniture which is made available through their retail as well as direct supply to large clients. In the Bangalore presentation at the Design Cities Debate it was clear to me that design would need to scale from being a play of materials and aesthetics to be able to move up the growing vortex of design concerns to include social, ecological and ethical levels of exchange and contribute at that level. Dovetail. IDIOM, Trapeeze, Ray + Kesavan and all the other design initiatives including the IT sector that is growing to cope with the higher offerings of knowledge economy and raising to the level of offering products would all be part of the next design revolution in the making, I hope. Bangalore had all the ingredients in place to move up the political ladder and to try and influence decision makers about the role of design in our evolving society and through this find a place for it which was I believe envisaged in the Eames India Report of 50 years ago. We need to re-read the Eames Report as well as his 100 Quotes and find our own way forward in this complex milieu if the next 50 years is to bring design closer to the hearts and minds of people who need to be served by this wonderful resource but they may not yet know that they do. The Jaanagraha’s feeble attempt to influence the participation of people (see my blog post below) in the local and national democracy is a good sign and designers need to back these initiatives and join them to make them work for all of us in the days ahead. 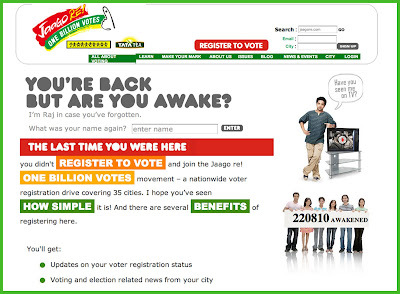 Image 1: Jaagore.com website with an aim to register one billion new voters as part of the Indian democracy. A new campaign has hit the regular TV programmes calling for an awakening of our youth towards the need to vote and be involved in the political process of the Local region, State and the Nation. The advertisment campaign is quite effective and I was curious to check what it held out as a promise for the youth to participate in individually and as a group. I have had my own problems with the electoral process since in the last General Elections I was unable to vote since my name was messed up in the electoral rolls and my ID card too had defects and worst of all my polling booth just could not be located all through the day in spite of trying several locations in our voting area. Image 2: Jaago re TV Commercial from the YouTube offer. I had tried to get my name corrected in a subsequent round of verification and I had visited a couple of schools to get my voter identity card reissued with a hope that the data would come out correctly but this too seems to have failed due to the clumsy manner in which the data collection was organized and I was on the lookout for another opportunity to correct this mistake. 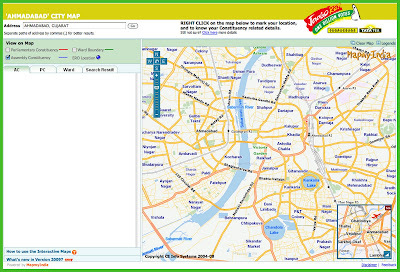 Image 3: Map interface that is offered to locate ones house and from it ones constituency for the registration process. This gave me the incentive to respond to the advertisment that appreaded on TV calling for new voter registrations which was launched in the public interest by Tata Tea Ltd and an NGO based in Bengaluru called Jaanagraha, and we were directed to a website called Jaagore.com, where the word Jaago means to wake up, a wake up call for all voters. The website proclaims a lofty ambition of registering one billion voters across 35 cities in India and so far at last look they had succeeded in getting all of 220839 people registered when I last checked the site. What I saw was encouraging. Someone had taken the initiative to use the web to reach out and build a system that could be of public good. However as I went further into the site I realized that while it was a technical success at the design level much still needed to be done if they were to reach their stated objective. 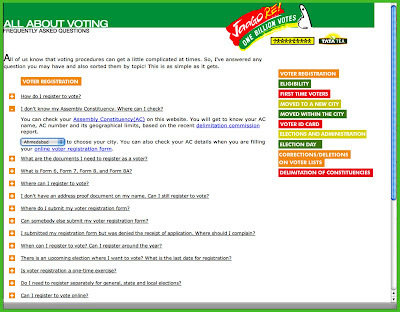 Image 4: FAQ about the voting process at the Jaago Re website. I had talked about Jaanagraha, the Bengaluru based NGO in my London debate about the next Design City and they were here involved in another venture for public good but I missed the use of design that I had advocated which could make this effort both effective as well as be a great experience for the user. What I miss the most is the language tools that could enable non English speaking citizens to participate in this initiative and the site itself could use many layers of design engagement which could make it an offering that could stand the test of variety and complexity which this current offering fails to provide. Not that this cannot be done. The web is very forgiving and flexible and at any stage the organizers can give their audience an improved interface and a much better feel and performance if they used design along the way. However I still give this a thumbs up for the initiative and wish it all the very best in the days ahead and hope that design finds a way into this initiative somewhere along the way of success. 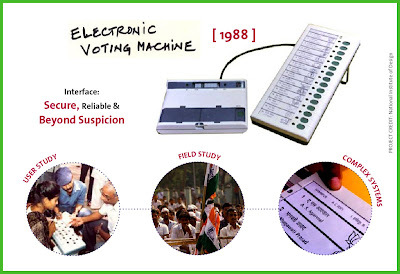 Image 5: Electronic Voting Machine – story of its design in 1988 at NID for the Election Commission of India. This reminded me of the Electronic Voting Machine that was designed by the National Institute of Design for the National Election Commission way back in 1988. It was the preliminary user testing that helped embed many intangible features into the interface at that time when perhaps for the first time cardboard models of the voting machine were taken into the field by the design team to conduct semiotic tests of issues of usability, particularly with illiterate users, and this is what I believe has made this particular design survive the test of time and it is still functional and effective It took ten long years to introduce it into 10 percent of the elections and another long period to reach the 100 percent mark and be used in all assembly and parliamentary elections across India. Design is a sensitive process and not just an object that emerges at the end of that process nor is it the effect of technology alone since there are so many human and other factors that need to be taken into consideration which makes it a truly wicked problem, but one that can be tamed with imagination and sustained design action. I do wish that the Jaagore web effort would follow this process through a number of iterations and reach the success that it deserves through the use of sensitive design thought and action in India. The people of India deserve this kind of attention and care. Design is indeed politics. Unlike the politics of opposition and negotiation that is practiced through the party politics of our times it is the the politics of proposition, consensus and conviction building that can be adopted by the leadership of the community. This is the message that I had conveyed in my London presentation at the Design Cities debate where Bengaluru was voted as the most likely candidate for the future title, if we get it right in the days ahead.